LA Sportfishing is a sportfishing charter service based in Marina del Rey, California at Dock 55. LA Sportfishing is owned and operated by JDF Ventures, LLC. We have a valid Water Taxi Operator License issued by the County of Los Angeles. Our vessel, the MARSEA, is California Dept. of Fish and Wildlife registered Commercial Passenger Fishing Vessel (CPFV) and is documented by the US Coast Guard for Coastwise Trade. All crewmembers are enrolled in a random drug testing program certified by the Maritime Consortium, Inc. While we strive to make your experience on the water as enjoyable as possible, safety always comes first at LA Sportfishing. Your Captain will begin the trip with a safety orientation. If the Captain feels at any time that the safety of the passengers or crew is in jeopardy, trips may be cancelled or cut short. Better to live to fish another day! We offer a variety of trips from ½ day local fishing trips to full day island trips. We also offer harbor cruises, nature cruises and burials at sea. 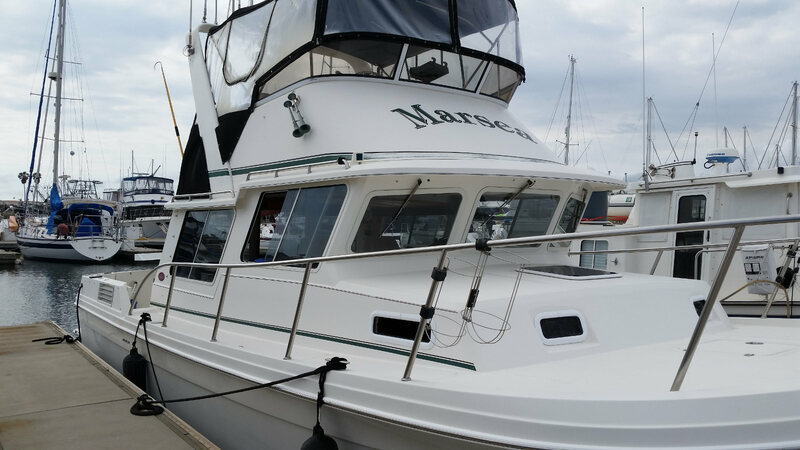 Our boat, the Marsea, is a US Coast Guard certified UPV and is examined annually by the Coast Guard. We are permitted to take up to six paying passengers plus crew. The Marsea has 8 adult Type I Personal Floatation Devices (PFD’s) and 3 child sized Type I PFD’s. LA Sportfishing is also affiliated with other charter operations from Ventura, Marina del Rey, Long Beach, Oceanside and San Diego. If one of our trips doesn’t fit your plans, we’ll help you find the perfect adventure! Give us a call to learn more. All trips require a 20% deposit. The deposit is non-refundable within 14 days of the planned trip. Deposit will be fully refunded for trips cancelled by LA Sportfishing due to weather or other issues.